Rugs There are 189 products. Break the chain of playing it safe and have some fun with your home decor. A very contemporary choice, this rug incorporates a dynamic, highly graphical print balanced by a sophisticated color palette for simplicity and versatility. This accent rug proves that retro-contemporary swagger is always in style. TV-shaped squares bounce off plush nylon in gray, white and red splendor for a multi-tonal, no-fuss finish. Whoever said traditional designs were a thing of the past clearly haven't laid eyes on this accent rug. Its ivory backdrop contrasts beautifully with the muted navy floral and vine aesthetic, and the symmetrical pattern is simply a dream come true in your home. 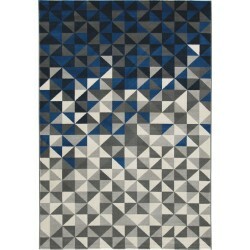 Transform your space in an ultra-cool way with this accent rug. Patterned in always-trendy ikat, its weathered look and neutral palette are tastefully subtle. Nylon fibers make it easy-breezy to clean, so you can enjoy its sophisticated design for a long time to come. Dive into a painted skyscape with this accent rug. What an enchanting palette that makes waves in contemporary style and design. Revel in the easy-care nylon that's soft and texturally appealing underfoot. Invigorate a space with color and contemporary flair. Offering a brilliant spin on the chic chevron pattern, this area rug is sure to please with its vibrant yet sophisticated palette and geometric design. Show your true stripes with this accent rug. The blue and green color palette sports fun design, while also displaying a casual-cool look wherever fits best. Flashback or fashion forward? 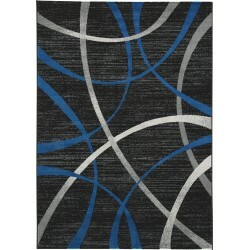 Shape up a space in a dynamic, graphical way with this area rug. Blending modern abstract art with a retro-chic palette, it's a look that's beautifully on trend. With its touch of tribal flair, this area rug is right on trend. Brown and cream palette exudes a mood of ease, while a thick, plush pile is made to please. Merging an ultra-modern geometric design with a retro-chic palette of black, brown and blue tones, this area rug invites you to express your artful eye. Thick, plush pile is decadently soft and crafted with durability in mind. 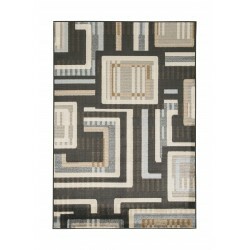 Delineate a space in a simply chic way with this area rug. Awning stripes in a black and tan palette are a fashionably cool mix. Roll out casual style with this medium-sized accent rug. Its repeated linked chain pattern is intricate, yet easy to love. Natural and cream colors found in the design provide neutrality great for matching it to any room's decor.